Strainer connects directly onto Shurflo pump inlet. 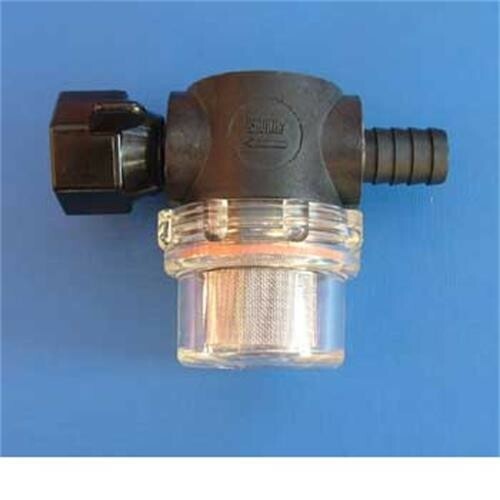 The strainer inlet is barbed to suit 1/2" flexible hose. Replaces older disc shaped strainer.255-225 on bottom. Just what we ordered. Quick delivery. Will use this company in the future. Finger tight fitting without leaks, see through strainer so you can tell if there is rubbish in the pipes. BUT, make sure you can access this really easily for wintering as the water will need to be manually removed in case of frost. The clear plastic body of the old filter cracked and fell to pieces. This new one is a different shape, but fit easily and seems to work. Good service from Leisure Shop Direct. Excelent quality robust and simple! Shurflo Strainer, Barbed Inlet - Same But Different. Old water pump stopped working - blocked filter or strainer, seal broken. New filter came very promptly - we were impressed. Small enough to go through letterbox, so delivery no problem. It looked very different from the original, so husband queried if I'd ordered the right product. Easy to fit, no special tools needed, awkward location in our motorhome behind back of cupboard under sink. Much easier to check & clean the filter / strainer now as it fits to the side of the water pump and can be removed without having to uncouple the whole pump unit as before, when filter was in-line. Old filter was 15 years old, I expect this one will out-live the motorhome.